Mr Heath, the Nursteed Community Primary School Headteacher, mentioned that the competition was a good learning activity for the children. The school has consistently participated in the annual Devizes Rotary Youth Speaks event, thus underlining the value the school places upon it. Devizes Rotary’s annual Youth Speaks competition has come round again with a record entry of 12 teams from years 5 and 6 of 7 local schools. This event gives young people the opportunity to express themselves effectively whilst also encouraging a high standard of public speaking in a formal situation. Nursteed School again hosted the event on the 16th March. The selection of topics was impressive ranging from ‘Plastics in the Sea’ to ‘Donald Trumps Nuclear button’! The teams of 4 to 5 members consisting of a Chairperson, Proposer a Speaker (or speakers) and members talk for about 10mins to an audience of parents and teachers before answering questions from the adjudicators. The standard was very high but the winners were the team from Nursteed Community Primary School speaking on ‘Plastic Pollution’. The quality of their delivery, the level of the research and the response to the questions were most impressive to the adjudicators. Congratulations to the team and their teacher Amanda Dunstone! There was also a special prize for the most outstanding speaker and this was awarded to Jake Hinkman from Woodborough C of E Primary School. He was so obviously passionately interested in contrasting the Greek and Roman Gods. The annual Youth Speaks Competition, organised by the Rotary Club of Devizes, was won by the team from St Nicholas Primary School, Bromham. Seven teams of 4-5 students each met at the Nursteed Community Primary School on March 24 in an event designed to improve the public speaking skills and confidence of participants. Each team spoke for 10-15 minutes in front of an audience of parents, families, teachers and Rotarians on topics ranging from Donald Trump’s Mexican Wall to The Victorians. The winning team from St Nicholas spoke on Crime and Punishment Through History. A special prize for the most outstanding individual speaker went to Evan Dummett from Rowde Church of England School – his team spoke about the RAF in World War II. Subject: Donald Trump – Should a wall be built between Mexico and America? Notes: Year 6 have written to Donald Trump regarding this wall and it was thought that the year 5 would like to be involved in this discussion as well. The team are from year 5. Team 1: Amy Hulford(Chair), Lucy Farroll (Speaker), Isabella Bayley (Proposer), Alice Lawrence (Member), Dylan Cottee (Member). Notes: Woodland Wanderers is our school’s version of Forest School. The children attend Woodland Wanderers throughout their time at school and it provides invaluable learning experiences and opportunities. Team 2: Emma Heal (Chair), Lloyd McKendrick (Speaker), Laura Begent (Proposer), Alex Body (Member), Stevie Harris (Member). Notes: This topic caught the imagination of the children last term. They will talk about what interested them most and how learning was brought to life in the classroom. Notes: Discussing WW2 day, the main historical events of WW2, life in Britain during the war and the effect on clothing. Hoping to bring Artifacts from WW2. Notes: Technology – is it taking over from play? Is this a good or a bad thing? YOUNGSTERS from a village primary school took inspiration from a well known local landmark to help them with a public speaking contest. The pupils of St Nicholas Primary School, Bromham, gave a presentation on the Kennet and Avon Canal to win the Rotary Club of Devizes annual Youth Speaks competition. 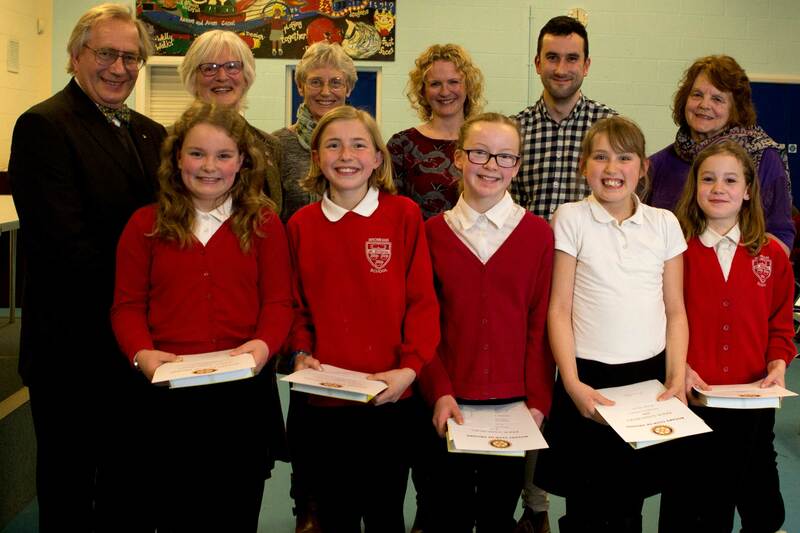 Five talented youngsters from St Nicholas Primary School, Bromham took their first steps in public speaking when they won the Rotary Club of Devizes annual Youth Speaks competition with a presentation on ‘The Kennet and Avon Canal’. Children from Rowde Church of England Primary Academy, St Joseph’s Catholic Primary School, and Nursteed Community Primary School also entered, each giving a 5-10 minute presentation to an audience of over 70 – judged by senior teachers from outside the area. The reminder letters went out to the Schools at the beginning of January for the competition on 20th March 2015 at Nursteed School.